2017 Trappist Westvleteren 12 by Brouwerij Westvleteren (Sint-Sixtusabdij van Westvleteren) is a 10.2% Belgian Trappist Quadrupel. Westy 12 is back! It has been 5 years since the last time I tried this beer. Back then it was the best beer in the world and even to this day I still think it is the best only because of rarity but mainly because it was an inspiration of a beer for since my first time trying Belgians. The best beers in the world commonly found to me are the St. Bernardus Abt 12 next to Trois Pistoles and the Three Philosophers. This beer is still difficult to get as you have to have an exclusive invite to the Monastery in Westvleteren and can only buy a limited quantity. Also, it has been difficult to get in the states since the one incident a couple years ago where they sold it at Total Wine where scalpers took many to sell online. Essentially, this beer was the best before the new IPA trends took over. Oh how people have forgotten that the old world of beers that have been made for hundreds of years should still be the best over these new and up and coming brews. It is the reason why this style is still my favorite despite the fact that while I do believe the newer hyped beers are delicious, they are no worth an arm and a leg. 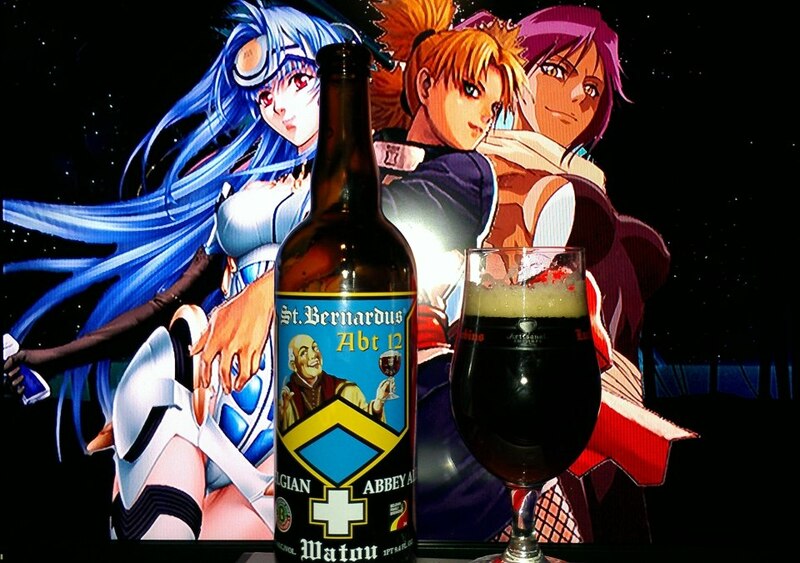 Also, while this one was hyped at the time, people forget that St. Bernardus Abt 12 is literally the same recipe but commercialized so many people in the world can know about the great Belgians. This is why I love St. Bernardus 12. It is easy to find but because I rarely get a chance to try this beer. I consider it slight above the best but in the rarity category. Let’s have a look and see how this tastes after years of me not having tried it. Cheers! Deep dark fruits, prunes, raisins, vanilla, burnt caramel, dulce de leche caramel, goat milk caramel, wined caramel, chocolate, wafflecone, butterscotch, toffee, marshmallow, rock candy, candi sugar, honey, piloncillo sugar cone, peppercorn, earthy hops, hazelnut nectar and golden apples. Supreme rich dulce de leche caramel, bananas, clove spice, dark fruit dates, raisins, plums, figs, flan, sweetened condensed milk, pecan pie, Danish cream, leather, rye, earthy hops, Stone fruit peaches, peppercorn, burnt sugar, rock candy, candi sugar, honey, piloncillo sugar cone, grapes, port wine, milk chocolate, candied apples, wafflecone, butterscotch, toffee, marshmallow, bubble gum, fig pudding, rice pudding, golden apples, hazelnut nectar, cherries, Mexican sweet bread, umami, Goat milk caramel, burnt caramel, anise notes, funnel cream cake, honey dew melon, tamarind and tiramasu. Rich lingering dulce de leche carame, dark fruits, stone fruits, vanilla, flan, sweetened condensed milk, pecan pie, port wine, Danish cream, leather, rye, earthy hops and mild chocolate lingers. No alcohol in the taste, smooth, silky, syrupy and creamy mouthfeel, Dark Golden Brown medium body and a moderate to sipping drinkability. A definite bucket lister! Simply because it is one of those beers that you have to try to believe. Granted, I have tried this side by side with St. Bernardus and while I think this one is only slightly better, they are pretty much in that same taste profile give or take. How does this taste to my homebrew? Well, I do have to admit how damn close the recipe came out to be to the point where I surprised myself. I actually made my dream come true and while I am not a Trappist Monastery monk, I have to say I definitely have that in spirit! It is always an honor to bring this magnificent beer to the site when I can and I suggest you give this a shot, even if one. Get that off your bucket list! 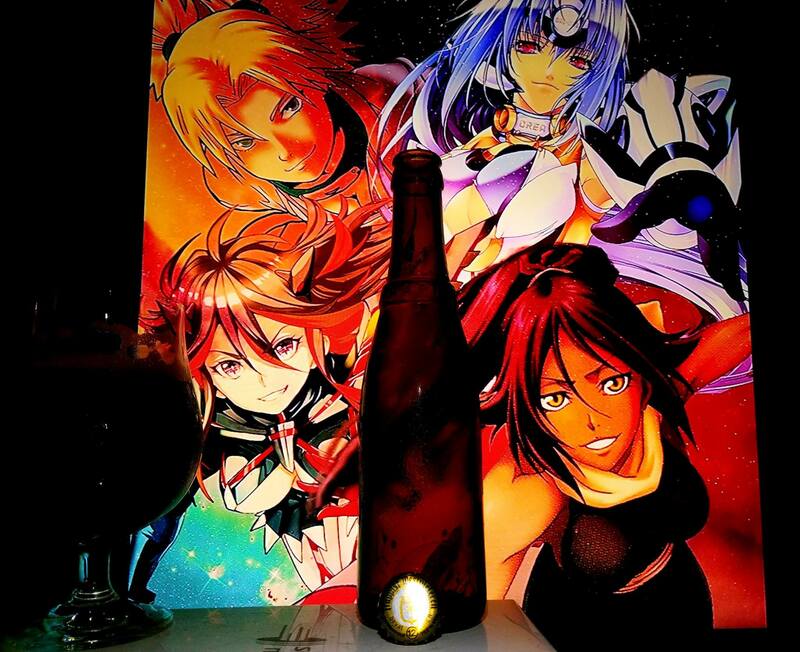 Temari Sabakuno from Naruto, Kos-Mos from Xenosaga, Ryuko Matoi from Kill La Kill, Yoruichi Shihouin from Bleach are chosen for very special beers. Since I first had a pairing with Temari, Kos-Mos and Yoruichi in the past, it was only fitting that I do this again but this time with Ryuko too. 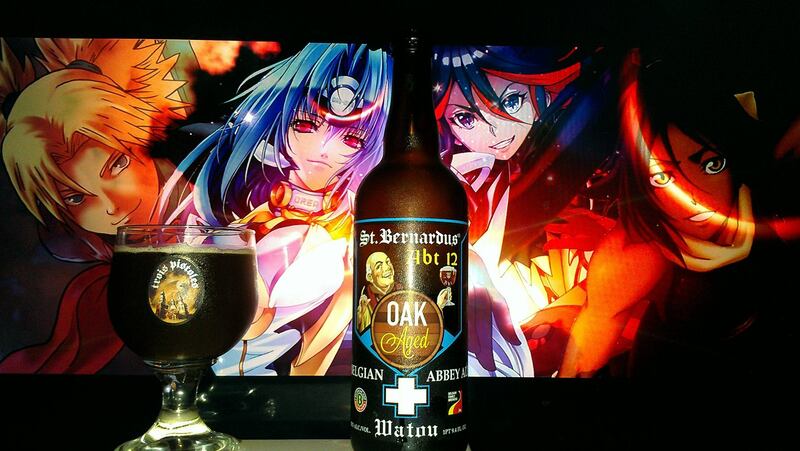 Being my favorite anime characters always get the best pairings in some of the beers I truly feel are deserving of that ‘Heavenly and Godly Ambrosia’ Liquid status as with many of the beers I have tried, I have used them in the previous St. Bernardus Abt 12 review except with the introduction of my recent favorite girl, Ryuko Matoi. The original time I tried this beer, it was the world’s best beer and the best Quadrupel since St. Bernarudus. It is this style of beer that grew my desire, my love and passion that lead to the the fruit of my labor with my homebrew ‘Las Quad-tro Monjas’. So heavenly fitting, my favorite top characters go with my favorite beers, especially this rarity. Brewery St. Bernardus was founded in 1946 in Watou, Province of West Flanders in Belgium. St. Bernardus Abt 12 is Brewery St. Bernardus’ flagship and is considered as one the best beers in the world. The Abt 12 is brewed following the original recipe from 1946. This St. Bernardus Abt 12 Oak Aged is brewed using the same recipe and then matured for 6 months in oak Calvados barrels before it is bottle coditioned. This maturation in oak kegs gives the beer a deeper and richer taste, leaving the palate remarkbly satisfied and thirsty for more. Serve this noble and wonderfully balanced brown ale at 53-56° F in a goblet glass to best enjoy its delicate bouquet. Never did I ever think that St. Bernardus would step up their game and release a barrel aged version of their Quad. Not just any barrel either, but the Calvados Apple Brandy barrel. Beers that usually are aged in these barrel jump 100 times the price of the original beer. Good thing this one just doubled the price. By that I mean it is still pricey as hell ranging anywhere from 25-30$ for a 750ml bottle. I didn’t care. I just just didn’t care as unlike any beer from the past, the St. Bernardus is a beer that always held a special place in my heart as it was my favorite when I first started trying different beers as early as 2010 and to this day I can always go back and say it is still my favorite despite the fact that there are others like the Weekday Bruery beers that are levels above it, it still don’t matter. Even after trying the Heady Toppers, the Dark Lords, even the Westvleteren 12… still didn’t matter… Abt 12 was my beer along with Trois Pistoles and Three Philosophers and others… So you can see the fact that this exist must be testament to my resolve not only as a reviewer but for myself and what I truly love and even to my first quadruple that I personally made… Cheers from this is like Cheers of the Heavens! Rich Dulce de leche caramel Apple pie, Brandy oak, vanilla, Goat milk caramel, marshmallows, Dark fruit plums, raisins, prunes, cherries, figs, dates, wine grapes, raspberry chambord, tamarind, stone fruit peaches, apricots, peach cobbler, mango, pie crust, Dark Candi sugars, Belgian Bread, Danish cream, Rock Candy, figgy pudding, piloncillo sugar cone,Bananas, plantains, clove spice, bubble gum notes, raisin bread pudding, rice pudding, cinnamon, flan, Mexican sweetened condensed milk, Red Apples, Golden Apples, Caramel apples, hazelnut nectar, pecan pie, cherry pie and burnt brown sugar. Dulce de leche caramel, Goat milk Caramel, piloncillo sugar cone, vanilla, oak, marshmallows, Dark fruit plums, raisins, prunes, cherries, figs, dates, wine grapes, raspberry chambord, tamarind, Bananas, plantains, clove spice, bubble gum notes, raisin bread pudding, rice pudding, cinnamon, flan, Mexican sweetened condensed milk, Red Apples, Golden Apples, Caramel apples, Brandy, Port wine, chardonay, stone fruit peaches, apricots, peach cobbler, pie crust, hazelnut nectar, pecan pie, cherry pie, dragon fruit, passion fruit, old mangoes, honey dew melon, butterscotch, chocolate notes, tangerine preserves, tobacco, leather, anise, grilled funnel caramel cake, Dark Candi sugars, Belgian Bread, Danish cream, Rock Candy, figgy pudding, Rich caramel Apple Pie goodness with vanilla cake and more. Lingering Apple Pie, dark fruits, stone fruits, dulce de leche caramel, vanilla, flan, sweetened condensed milk, Apple brandy, port wine, Danish cream, leather, rye and mild chocolate lingers. No alcohol in the taste, smooth, silky, syrupy and creamy mouthfeel, Dark Golden Brown medium body and a moderate to sipping drinkability. No surprise why this version of one of my favorite (commonly available) beers in the world is simply another one I needed to add to my bucket list of beers. The original St. Bernardus was my inspiration for making the original quad I made a couple of months back as it was one of my favorites in the world while started trying different craft beers along with Trois Pistoles, Three Philosphers and many delicious others. 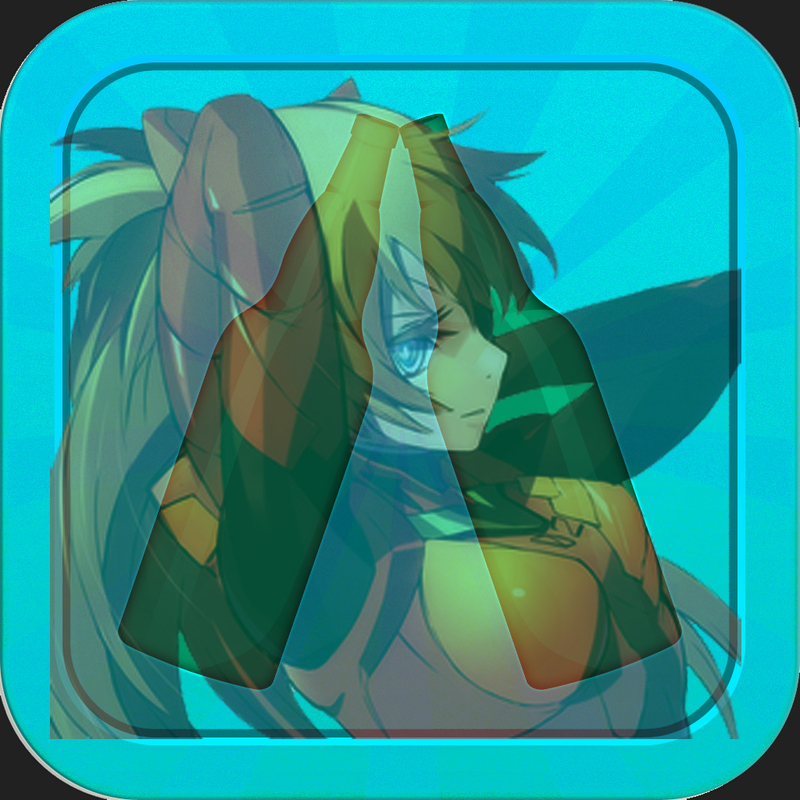 This version is something that really took it above the heaven into that “Ambrosia of the Gods” status. I really didn’t care about the price, I really wanted to bring this one for a review ever since its announcement and I finally did it! I think the whole Calvados/Apple Brandy aspect is what really did it here taking this liquid caramel into an Apple Pie beer goodness. Who knows what will happen to this in … 15 years! 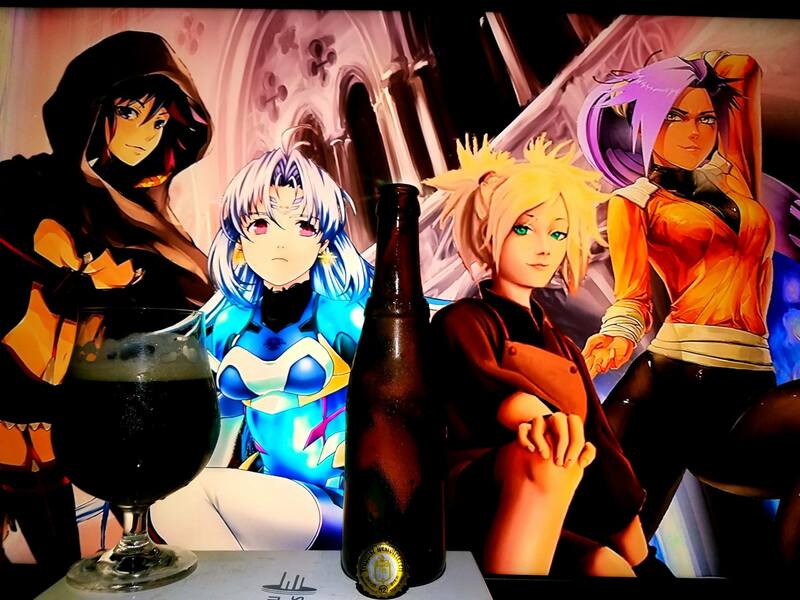 Temari Sabakuno from Naruto, Kos-Mos from Xenosaga, Ryuko Matoi from Kill La Kill, Yoruichi Shihouin from Bleach as being my favorite anime characters always get the best pairings in some of the beers I truly feel are deserving of that ‘Heavenly and Godly Ambrosia’ Liquid status as with many of the beers I have tried, I have used them in the previous St. Bernardus Abt 12 review except with the introduction of my recent favorite girl, Ryuko Matoi. Like I said before, the original version of this beer was my world favorite, my desire, my love and passion that became my favorite style of beer and today, the fruit of my labor with my homebrew ‘Las Quad-tro Monjas’. Yes indeed, I don’t have to explain much about this and long time readers can already infer why I choose them. The greatest of the greats.